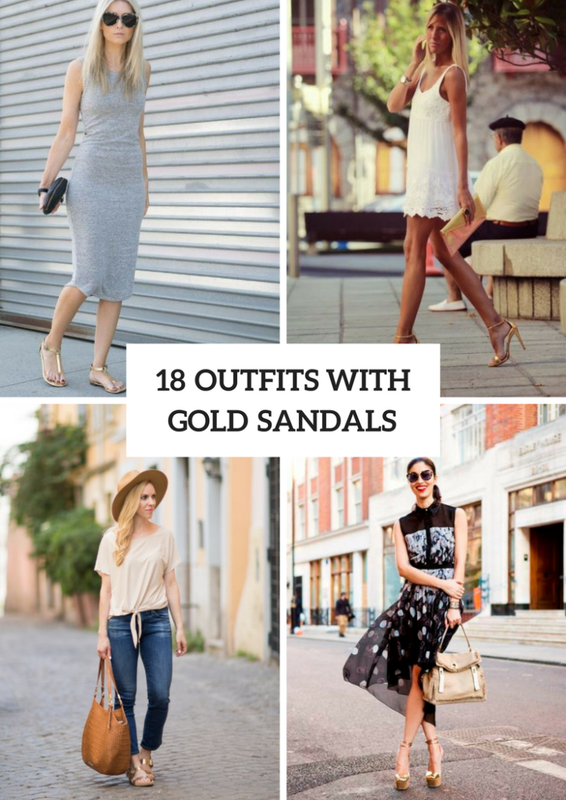 If you’re looking for awesome and glamorous sandals ideas for further summer days, then I offer you to pay an attention to golden ones. They look wonderful with all colored pieces of clothes and accessories, so all you need is to decide what type of sandals you want: flat, low heeled, platform ones or high heels. Now let’s scroll down and consider some examples how you can combine such shoes with other items. Enjoy! For those who want to create an elegant or cocktail party outfit, I offer to combine a black sleeveless crop jumpsuit with a golden chain necklace and golden high heels. 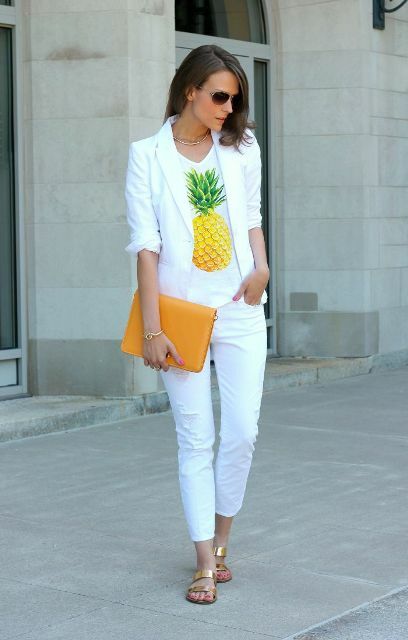 If you wanna make a casual look, then you can mix a printed t-shirt with a white blazer, white crop trousers, an orange leather clutch and golden flat sandals. Or take a beige tie front blouse and pair it with navy blue crop jeans, a beige wide brim hat, a brown leather tote and golden sandals. 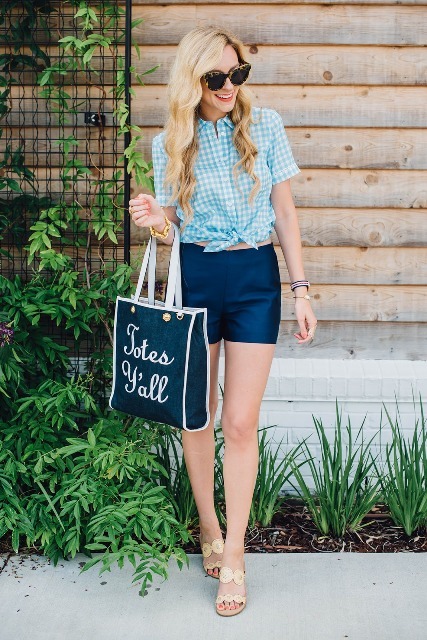 If you’re looking for outfit ideas with shorts, then repeat one with a button down shirt, a white sweatshirt, a navy blue wide brim hat, classic blue shorts, a light brown crossbody bag and gold ankle strap flat sandals. Orange or yellow dresses look fantastic with gold shoes, so you can take an orange maxi dress and combine it with a black leather jacket, golden flat sandals, sunglasses and a black bag. Or if you wanna something eye-catching, then choose a burnt orange knee-length dress with a fringe and mix it with gold platform heels. For an elegant and chic look you can pair a light blue blouse with a blue oversized blazer, a colorful mini bag, golden metallic A-line midi skirt and golden cutout sandals. Or find a white fitted mini dress and combine with a beige clutch and platform shoes.